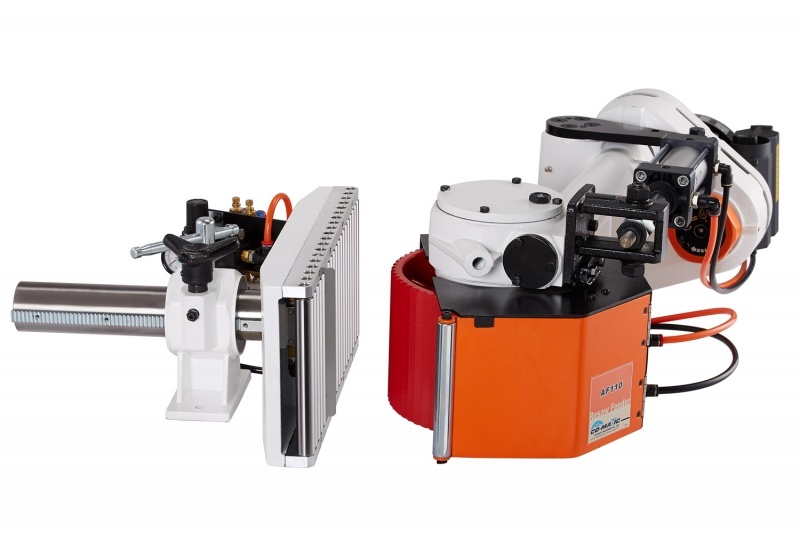 The AF110 Pneumatic Bandsaw Power Feeder is ideal for heavy duty resawing on a bandsaw. It's pneumatic adjustment eliminates the need to readjust the feeder after multiple passes or changing widths/thicknesses. 1. 9.5" is required from the tip of the blade to the end of the table on the outfeed side. 2. 12.3" is required from the tip of the blade to the end of the table (opposite the fence). *Similar to the AF19N Resaw Feeder with a larger motor, roller, and variable speeds. Max Roller/Blade Clearance - 9-1/4"
Speed settings can easily be adjusted depending on your requirements. With speed settings ranging from 3.3 - 98.4FPM, the AF110 provides convenience and consistency for resaw feeding. Max. Height of Rollers 6-3/16""
*Ships via LTL Freight: Residential Delivery and additional freight services such as liftgate service, etc., may incur additional freight charge. Please contact us before purchasing if this is the case.